The paisley design looks like a teardrop with a curve at the top. The design originates in India and was brought to Europe and America in the 18th and 19th century. Most notable were the paisley scarves brought in by the East India Company. However, the design only got its name when it started being mass-produced in the large Scottish textile town of…you got it… Paisley! The paisley print went in and out of fashion for the next couple of decades and made its big comeback in the 1960s in the U.S. In the 1960s multi-cultural looks were the rage and the paisley pattern was back in its full glory. John Lennon or Beatles fame even had one printed on his Rolls Royce! Nowdays, some of the more common items that have the paisley print are handbags, skirts, paisley sunvisors, paisley wallets, ties and of course the bandana! 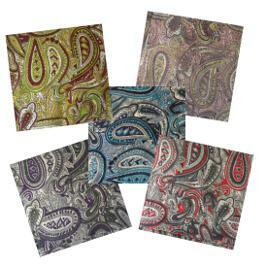 Paisley bandanas can come as squares, triangles, or in their pre-tied bandana head band version. So go ahead – it’s not just for the summer! The paisley print will carry you all through the year with its rich history and classic look!